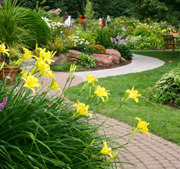 Suburban Lawnscapes provides lawn care and landscape maintenance services of uncompromising quality. Stationed in Manassas, Virginia, we offer communities across northern Virginia the vitalization and upkeep needed to ensure landscapes that always look vibrant, lush and finely manicured. Providing service for a wide range of clients and properties, including single family homes, homeowners associations (HOAs), townhome communities, churches, hotels, motels, and retail strips. More reliable service, better results, and a new customer discount to top it all off! Click here for more details on our lawn care and landscape specials! From lawn fertilization to weed control applications, your lawn deserves to be cared for by certified professionals. We use our firsthand lawn care experience to ensure your lawn grows greener and healthier than ever before. Call (703) 335-1477 to receive a free estimate or contact our Manassas lawn care specialists online. Need lawn mowing, edging, trimming, and landscape bed maintenance? Suburban Lawnscapes provides everything your landscape requires to keep its appearance clean and lovely throughout the seasons. Receive comprehensive lawn care and landscape maintenance from an experienced team. Call (703) 335-1477 or contact Suburban Lawnscapes online. Serving entire northern Virginia area, including Manassas, Haymarket, Bristow, Fairfax, Chantilly, South Riding, & Vienna, VA.
Our lawn care programs and landscape maintenance packages are tailored to suit any lawn and every customer.